Nerves then joy for Crocker The Collingwood Media team meets Ben Crocker, the club's fourth selection in the 2015 National Draft. Collingwood will blood its fourth new face of the 2016 season when Ben Crocker makes his AFL debut against Carlton at the MCG on Saturday. Crocker’s debut comes six months after being Collingwood’s final selection in the 2015 National Draft. 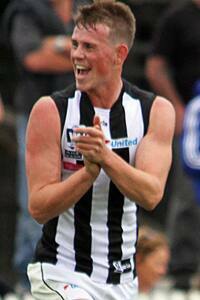 Since, the 181cm forward has built a strong body of work in the VFL. He’s kicked seven goals in four games, while averaging 11 disposals and five marks per outing. And now comes the biggest stage of all – a debut against the old enemy at the MCG. Joining Crocker as inclusions into the side to take on the Blues are two men slightly more experienced at AFL level. WATCH: Surrounded by family and friends, watch the moment Ben Crocker learns he's been drafted by Collingwood. James Aish returns to the senior team to replace the injured Ben Sinclair, while Jesse White is expected to take fill a void in the backline left by the omission of Nathan Brown. The transformation of White from forward to defender has been deemed as a success in the VFL in recent weeks. The 108-gamer has been the VFL Magpies’ best player two weeks running and played a match-winning role in a nine-point victory over the Northern Blues last Saturday. As confirmed early in the week, defender Tom Langdon will be sidelined with an ankle injury, while Taylor Adams and Travis Varcoe failed to overcome fitness tests on Thursday morning. "Tay (Adams) won't come up,” coach Nathan Buckley said earlier in the day. “He was trying really hard and pushing to come back. He'll be at least another week." The Saturday afternoon match will mark the 14th time the Magpies and Blues have played for the Peter Mac Cup. Buckley’s team has a strong recent record over rivals Carlton in recent years, with six consecutive victories against the men in the navy Blues.